On March 24, 1976 a US-backed military coup was carried out in Argentina that installed the bloodiest civic-military dictatorship in the history of the country. In 2002 the Argentine Congress declared that this tragic day would be remembered as the National Day of Remembrance for Truth and Justice. 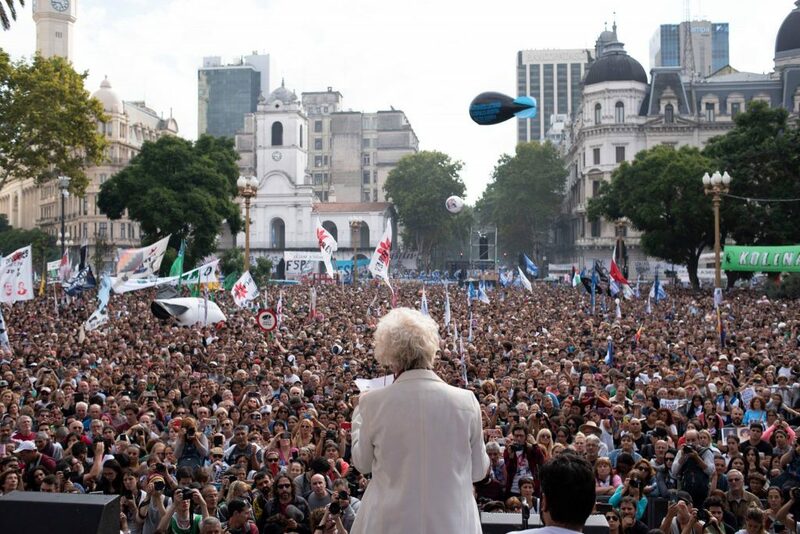 On March 24, 2019, 43 years since the coup, over a million people, members of human rights organizations, social movements and political parties mobilized across Argentina, paying homage to the victims of the civic-military dictatorship in Argentina and protesting the reverses in the area of human rights during the present right-wing government of Mauricio Macri. In Buenos Aires, hundreds of thousands marched to the Plaza de Mayo, completely filling the surrounding streets for several blocks. The hundreds of organizations and movements marched with music, performances and massive banners to bring to life the memory of the victims of the bloody dictatorship, and continue to call for punishment for the political, military and economic elites that enjoy impunity despite their crimes during the dictatorship. 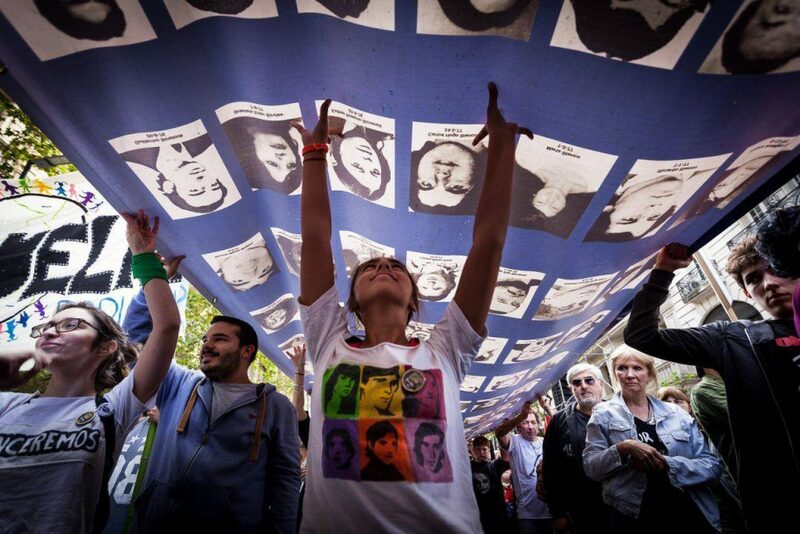 The Mothers of the Plaza de Mayo and their supporters carried a 500 meters-long flag with photographs of the 30,000 detained and disappeared during the dictatorship. In Rosario city of the Santa Fe province, more than 100,000 people and members of various social, feminist and students organizations hit the streets with the slogan “We don’t forget, we don’t forgive, we don’t reconcile”. Over 10,000 gathered at the Plaza San Martin in the La Plata city of Buenos Aires province also to pay tribute to the victims of the coup of 1976. Mass mobilizations were also carried out in the provinces of Córdoba, Neuquén, Santiago del Estero, Jujuy and Chaco as well as in the cities of Bariloche and Salta in condemnation of the last military coup. The mobilizations were called for by the human rights organizations such as the Grandmothers of Plaza de Mayo, the Mothers of Plaza de Mayo, the Sons and Daughters for Identity and Justice against Oblivion and Silence (HIJOS) and the Coordinator against Police and Institutional Repression (CORREPI), several of which were formed as a response to the state terrorism and repression during the dictatorship. De Carlotto also highlighted the fact that there are still hundreds of missing “grandchildren”, who are the children of detained and disappeared militants that were detained with their parents or born in captivity and then disappeared. Some 500 grandchildren were appropriated as war trophies by the repressive forces and handed over to military families, sold or abandoned in state institutions. The Grandmothers of the Plaza de Mayo, along with the Mothers of the Plaza de Mayo, have been at the forefront of the struggle for justice and truth for the 30,000 detained and disappeared and so far have recovered the true identities of 128 grandchildren. In the document, the Argentine human rights organizations also criticized the government of Cambiemos for its human rights record. “We are also here because we continue to struggle. We are demonstrating against the enslavement that the government of Mauricio Macri generates every day: mass dismissals, planned misery, handing over the country to the vultures, persecution of the indigenous people; persecution of activists; political prisoners; serious interference of the government on the Judicial Power; setbacks in Memory, Truth and Justice, institutional violence, repression of social protest, censorship of the media, denialism; and also brings us here, the defense of all the rights of women, lesbians, transvestites and trans,” it reads. A document commemorating struggles of the victims and their families, by the Memory, Truth and Justice Meeting, a national coordinator of more than 300 human rights, students, social, trade union and political organizations, was also read at the Plaza de Mayo. The military coup saw the National Reorganization Process, headed by General Jorge Rafael Videla, Admiral Emilio Eduardo Massera and Brigadier-General Orlando Ramón Agosti overthrow the constitutional government of Isabel Martinez de Peron. The regime remained in power until December 10, 1983. Since 1986, human rights organizations and social and political movements march to the Plaza de Mayo on March 24 to remember the 30,000 disappeared people and to demand justice and reparation for the cases of enforced disappearances, torture, murder as well for the systematic theft of newborns and other crimes against humanity. There is another horror unfolding in Argentina. The World Bank forced them to grow RR GMO soy in their grasslands, and there is a huge number of dead and deformed babies being born there. They spray over whole communities, pollute the water, and there are documentaries that are heartbreaking of the effects on families of chemical agriculture. This is called development! But, the article was about the repercussions of our assistance in the military coup there. No other country has successfully changed the out comes of our elections, except maybe Israel. But we have caused many governments to be overtaken. I don’t see how the previous comment addressed that.